This estate of single storey 1980s built homes were all given an unusual feature entrance, and some thirty years on, the current owners, Mr & Mrs Webster were keen to retain the look whilst giving their home a fresh face. 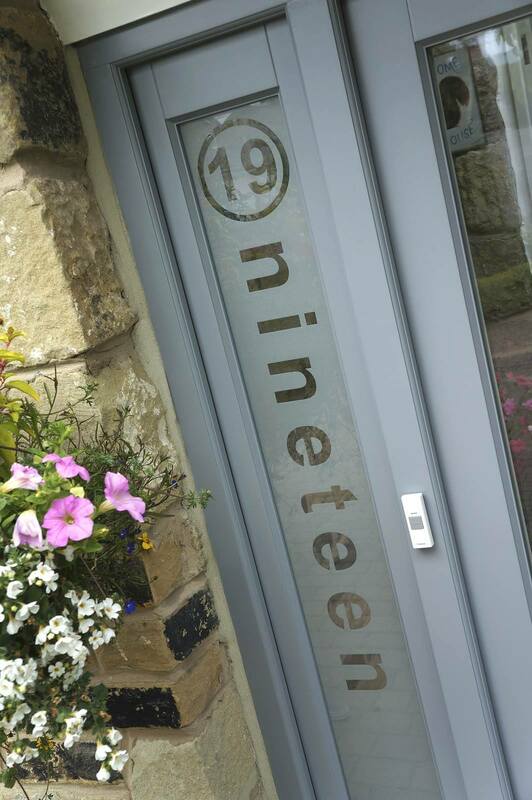 This design is a bespoke interpretation of an Apsley glazed door and multiple sidelights in engineered timber, with sandblasted panels, stainless steel hardware, an etched house number and a 36mm modern glazing bar formation, with a dual colour finish; Flatiron Grey externally and White internally. “We were really pleased to find a company that could accurately recreate this rather unusual style of door for us, and the installation was carried out fantastically well; it’s given the house a real facelift” Mrs Webster concludes.